Discussion in 'General Science & Technology' started by Jozen-Bo, Apr 25, 2017.
the noise, not the code, in the non-coding, not the coding, stretches of DNA. The term flicker noise is sometimes used to refer to pink noise, although this is more properly applied only to its occurrence in electronic devices. Mandelbrot and Van Ness proposed the name fractional noise (sometimes since called fractal noise) to emphasize that the exponent of the power spectrum could take non-integer values and be closely related to fractional Brownian motion, but the term is very rarely used. So there are no fractals in biology ? 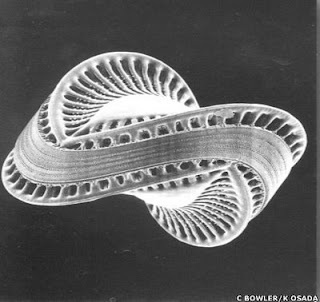 Or parabolas, or circles, or hyperbolic paraboloids (https://i.pinimg.com/736x/11/d0/8c/11d08cab2ecfbb795137a51917232496--marine-life-science-nature.jpg), or cubes. In theory this "can" be an infinitely repeatable loop, or number of iterations. But nowhere does it say that it "must" be infinite to form a fractal structure. As far as I know , no equation is a physical thing in and of itself. It is a description of a naturally occurring phenomenon. E = Mc^2 is not a thing, it is an algebraic description of the values of a energetic potential. Sometimes this is causally expressed in nature such as observed in a nova and sometimes we can duplicate the equation in an artifice, such as an atomic bomb. Z = Z^2 + C is not a thing, it is an algebraic description of a iterative loop function. Sometimes this is expressed in nature (as shown previously) and sometimes we can duplicate the equation in an artifice , such as an artistic form. a) Infinitely small cannot be physically attained, ever, I believe 10^-33 is the current established limit of physical expression, which places a natural limitation on the physical expression that can be attained. in spacetime. Does E =Mc^2 exist at 10^-33? Yes? No? Possibly? b) Both equations allow for a variable value, which determines the form, shape and length in which the equation will be expressed (unfold), but also places a practical limitation on the physical expression. Any physical thing which follows the variable fractal equation in nature, for any size or length of time, may be called a natural fractal. In DNA coding some parts call for specific fractal cell division such as for neural networks, arterial networks, lung formation, etc., until a "stop growth" switch cancels that particular growth instruction. In nature, infinite fractals do not (cannot) physically exist, but the function can exist for a number of iterations allowed by the equation, or by physical limitation. I have clearly demonstrated that this equation occurs in nature, with numerous examples which display their fractal properties. Promises, without your fingers crossed behind your back? But nowhere does it say that it "must" be infinite to form a fractal structure. The fractal is "formed" in the limit at infinity of those iterations - anything short of that isn't even a curve, but a scattering of points. Sometimes this is expressed in nature (as shown previously) and sometimes we can duplicate the equation in an artifice , such as an artistic form. That is possible only approximately - and of course nature "expresses" such a thing only in careless metaphor: there is no necessary or common correspondence between natural mechanism and the structure of that equation, and the idea of a natural form building up in that pointillist fashion is implausible in the extreme. Any physical thing which follows the variable fractal equation in nature, for any size or length of time, may be called a natural fractal. None do, would be the natural bet - that "variable fractal equation" produces a scattering of disconnected points, one per iteration. Nothing in nature that I can think of acts like that, at least in the classical world. No, right now I'm tired of arguing. I'm not learning and apparently my critics are not open to learning. What's the use? If anyone else is interested enough to continue on this subject, I'll be happy to research and share anything I can come up with. I felt the same about time existing. Stepping back for a while. Currently working on "concessness"
As long as the resulting "shape" is infinitely self-similar (as per the Wikipedia definition), you are right. Are you claiming that happens with a finite number of iterations for that expression? If so, please demonstrate that. E = Mc^2 is not a thing, it is an algebraic description of the values of a energetic potential. That's not how you should use the word potential in physics; it's somewhat misleading. But I understand what you are saying. Sometimes this is causally expressed in nature such as observed in a nova and sometimes we can duplicate the equation in an artifice, such as an atomic bomb. You appear to be referring to Planck scale. Those are not unitless numbers. Your question as it stands it thus nonsensical. Additionally, since an equation doesn't exist (as in, has physical presence), which just a single sentence ago you agreed on, the answer is obviously "no". If you are asking whether the expression still holds, then the answer is that we have no reason (evidence) to suggest otherwise. But there's a problem. "At any size" conflicts with the definition of fractal. It should be "from a certain size, at all smaller scales". And that is physically impossible for matter, due to atomic theory. In DNA coding some parts call for specific fractal cell division such as for neural networks, arterial networks, lung formation, etc., until a "stop growth" switch cancels that particular growth instruction. Fractal cell division is not a shape, so that might work. However, the presence of a "stop growth" switch probably means it's not a fractal. Yes, and so it complies with a couple of iterations, but that doesn't lead to a fractal (as far as I know). But the fact that they are results of only a finite number of iterations makes them not fractals, but "approximate fractals" or whatever you want to call them. Your posits are in violation of the definition of fractals. You are using the word incorrectly. As long as you are unwilling to accept that, further discussion will indeed be fruitless. It's us that's not open to learning? How often did we have to point out your incorrect usage of words? You even admitted it for the word "function"! After all these pages, it has become quite clear that it is you that you are projecting with this statement. "Z = Z^2 + C is not a thing, it is an algebraic description of a iterative loop function. Sometimes this is expressed in nature (as shown previously) and sometimes we can duplicate the equation in an artifice , such as an artistic form." Not "sure". That grants too much. The jump from having an equation or algorithm that via various human means (of recording, display, etc) produces forms in some media resembling those found in nature (in different media), to claiming that nature is producing those forms as "expressions" of those equations, algorithms, or functions, is a very large and dramatic leap without anything in the way of visible support. Even if the natural forms were to all appearances actually fractal over all measurable scales, that they were produced by somehow "expressing" the posited mathematical entity used by humans in describing them would be a dubious claim in need of serious and careful support. For example: the manner in which the posted (Mandelbrot) equation produces approximate fractals for us to see, the "expression" of that mathematical entity, has no analog in the natural world afaik - regardless of any resemblance of approximate forms produced. This is interesting. Has anybody produced a model by which a biological structure takes on a quasi-fractal form as a result some iterative growth process, based on an actual, specific, fractal equation? What I'm looking for is a biological analogue of the way objects in physics follow actual, specified equations that relate their properties or behaviour. Or are all these "fractal" appearances of things still stuck at the level of handwaving about appearance and iteration, with no actual mathematical model? I concede that I goofed. I'm just not used to watching out for these weird definitions, and I should've balked at the word "expressed", and what that (in this context) implied. And now that I reread it, I see what you're saying, and that whole quote is the "wrong way around". "These studies show that, if flower elements appear at a position on a circle successively with a constant delay time under the influence of repulsive forces from those appearing earlier and if those flower elements shift towards the radial direction, then they form sunflower patterns similar to real ones with spirals of Fibonacci numbers. Since position of each new flower element is determined so that the potential energy associated with the repulsive force becomes minimum, this problem is analogous to that of phyllotaxis which assures the most efficient configuration of leaves." The principle of minimum potential energy gives rise to Fibonacci sequences. I wouldn't be surprised if there are similar cases to be found that result in fractal-like patterns. Ah OK. So some suggestion of how a mechanism might work that follows a fractal algorithm, but no actually identified mechanism, so far. I certainly have found nothing along those lines, no. is plausibly or even likely to produce self-similarity over a range of scale - the similarity via the repeating mechanism, the scale range by growth of each stage. So start small and grow fractally might be biological nature's common approach - if that strikes others as plausible. That is the opposite of the most common type of human algorithm for producing fractals, those that start with the largest scale and subdivide. And it differs fundamentally from the other common type of fractal generators, such as Mandelbrot's famous one, which generate a cloud of separate points that gradually takes shape as a curve or volume etc over millions of iterations. Sure, the general idea is clear enough. But what I was asking was whether any specific mechanisms, obeying specific fractal algorithms, had yet been identified. It seems not. The fern code developed by Barnsley is an example of an iterated function system (IFS) to create a fractal. This follows from the collage theorem. He has used fractals to model a diverse range of phenomena in science and technology, but most specifically plant structures. ...we speculate that when a V -variable geometrical fractal model is found that has a good match to the geometry of a given plant, then there is a specific relationship between these code trees and the information stored in the genes of the plant. This is just yet more geometry, apparently resembling nature (gosh wow) but not related to it by any discovered, specific mechanism. In other words no science, so far. L-systems were introduced and developed in 1968 by Aristid Lindenmayer, a Hungarian theoretical biologist and botanist at the University of Utrecht. Lindenmayer used L-systems to describe the behaviour of plant cells and to model the growth processes of plant development. L-systems have also been used to model the morphology of a variety of organisms and can be used to generate self-similar fractals such as iterated function systems. Question: are you looking for a form of bio-chemistry or a DNA code, which regulates the growth of fractal plants?